Understanding what allows an offense to flow rather than become stagnant is key to offensive efficiency. When a team has the disc, their offense is in one of two states: it’s either stagnant or it’s flowing. On one end of this spectrum, stagnant offenses struggle to move the disc — both vertically (to gain yards) and horizontally (to improve field position). The timing of cuts is off, movement is tentative, and the defense always appears to be at least one step ahead. When a stagnant offense does move the disc, it happens slowly, in fits and stumbles, and often in highly structured or deliberate maneuvers that don’t result in beneficial continuation. On the other end of this spectrum, flowing offenses move the disc quickly, eating up the field in quick spurts or a controlled wave. They utilize excellent team chemistry and timing on their cuts rather than predictable set plays, and the disc often changes hands every couple of seconds. Many ultimate players will have experienced — even if only once or twice — what it feels like to be in perfect unison with the rest of your team, where every pass seems to make itself obvious as soon as you catch the disc and your offense moves the disc effortlessly up the field. But even for non-players, it’s easy to see that offenses that find a consistent flow are much more dangerous and difficult to contain. Understanding what allows an offense to flow rather than become stagnant can help newer players make better decisions on the field and develop their offensive game. The quintessential stagnant offense comes when a pull goes out of bounds. As the disc gets walked into play, the handlers and cutters set up in their positions, giving their defenders the opportunity to determine which parts of the field the offense is looking to attack and then put themselves in the best position to protect that part of the field. Having time to intentionally set position before the disc is in play makes it difficult for their marks to get open, and easier for the defense to herd them into space that is better protected or not as dangerous. Below, we see Seattle Mixtape checking in an out-of-bounds pull at the 2016 US Open. With Mixtape playing a deep horizontal stack, Boston sets up their handler defenders in the downfield lanes to shut down in-cuts and funnel the disc to the outside. As the disc moves backwards and toward the sideline, we see the defenders shift their positioning to push the cutters out, where the only option for the throwers it to attempt a long, difficult huck or continue to move backwards. Without connecting on a first pass to get the disc and the defense moving, Mixtape is unable to get into their flow. Their continuation cuts are not timed correctly, allowing Slow White to continue to dictate where the disc goes with their defensive positioning. Offenses that stagnate allow the defense to anticipate where the offense wants to go next and then position themselves to prevent it from happening. When the offense is flowing, however, the advantage is taken away from the defense. 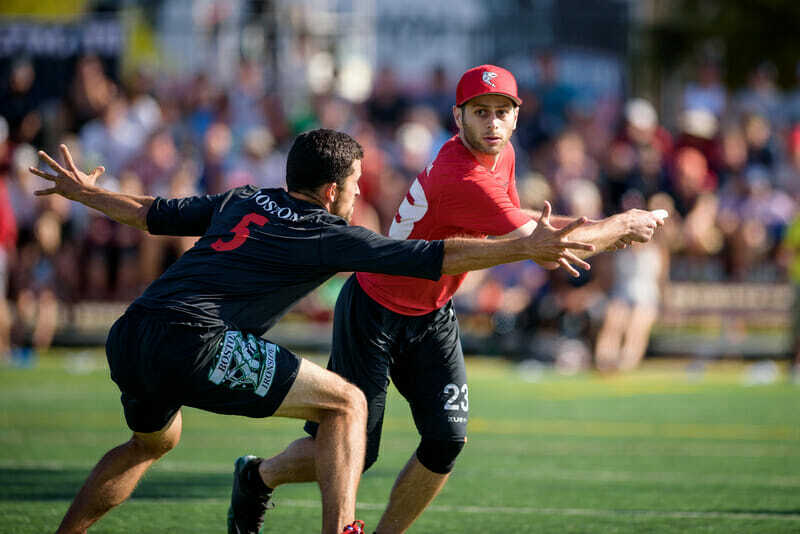 The instant the disc moves from a thrower to a receiver — whether it’s on a huck, an undercut, a swing pass, or anything else — the areas of the field that the offense can attack next change. Sometimes, this change is subtle. Other times, it’s drastic. A flowing offense will exploit these new attack angles to punish a defense before they can recover or adjust their spacing. For example, when the offense completes a long undercut, the receiver who catches the disc is often only a few yards shy of the rest of the cutters, making a continuation huck a much more viable option. Defenders who were focused on preventing unders are now easily burned deep. Below, Oregon is running a horizontal stack in their quarterfinal game against Texas at the 2014 College National Championships. The first Ego cutter from the inside force lane gets an undercut in the center of the field. With an empty lane in front and lots of empty space deep, a huck to the force sideline of the endzone is suddenly an easy throw to make. The downfield Texas defender that had been focusing on preventing the undercut is now out of position to guard his mark deep. The thrower looks off the pass, but the defender was powerless to prevent the deep look. The real key here is that even though the new thrower looks off the continuation huck, he keeps the disc moving quickly. As the Texas defense rotates to help cover the potential deep shot, another Ego cutter found himself free for a second open under cut. As the flowing offense follows the play, they bounce the disc from open throw to open throw — eventually hitting the deep cutter on an undercut to the breakside — before Texas is ever able to set a mark or even get back on the correct side of their marks. Not every throw creates the same amount of flow. Additionally, different completions create flow in different directions. In the Mixtape example above, the dump throws toward the force side sideline did not do enough to change the angle of attack, leaving the offense without a viable continuation throw to generate any flow. A successful undercut like the one completed in the Oregon v. Texas clip above creates downfield flow, allowing the offense to attack the deep space in ways that it couldn’t mere seconds earlier. Break throws, on the other hand, create lateral flow by allowing the offense to attack the opposite side of the field. These throws can be especially effective because the flow that they create can last for more than just a single pass. Moving the disc to the break side of the field puts every downfield defender out of position, rather than just one. Unless the defense can contain the flow of the disc laterally, the offense can ride it into the break side, and then vertically down the field as cutters find themselves uncontested in empty space. You can become a better contributor on offense by knowing how to use the flow to get open. As you see a pass get completed, you can ride the flow by cutting towards the space that was inaccessible before the throw, but is now available to your new thrower. For the next instant of game time, this particular cut is not on your defender’s mind, giving you a huge advantage. Attack where the disc is going. At the very start of the clip below, we see #9 on Team Japan leaving the screen as she makes a deep cut in the center of the field for a thrower all the way on the force sideline. The throw did not go up, and the cutter has to clear back under. As Japan changes the angle of attack by moving the disc laterally toward the break side, the same deep space now becomes a viable option and #9 repeats nearly the same deep cut to catch an easy huck goal. Riding the flow requires perfect timing. If you try riding the flow, only to find that your targeted space is already being attacked by one of your teammates or already has a defender there, then you’re behind the flow of your offense. Recognizing this is useful, because it means that the defense is focusing on defending the newly accessible field space. But being late does not mean that you can’t still make a viable cut for your new thrower. Again, we see a Sockeye offense flowing to the breakside to attack. In this instance, a Fire of London defender recognizes the danger and drops off into the breakside lane rather than chasing to try to put on a mark, getting to the space before Sockeye’s deepest cutter arrives to collect a continuation throw. Seeing that he is too late to continue attacking the way the disc is going, the Sockeye cutter stops his cut and peels off back toward the force side for an open goal cut. With defenders scrambling to contain a disc moving quickly, you can also utilize flow to get open by running contrary to the flow, attacking the field space that the defenders are now leaving or ignoring. These contrary cuts are critical to preventing the flow of an offense from stagnating. For example, in the clip below of the 2013 matchup between Pittsburgh and Carleton at the Stanford Invite, Max Thorne catches the disc on the force side on the doorstep of the endzone. Before Thorne even turns around, two Pittsburgh cutters try to ride the flow and attack the near cone, but abort after Carleton’s defense manages to stop them. Unfortunately, none of the Pittsburgh receivers run contrary to the flow — the breakside of the endzone, where Thorne could easily have dropped a hammer, does not get attacked until the final seconds of the stall count, when #19 heads there out of desperation. With timing off and the flow lost, the offense stagnates until Tyler Degirolamo catches his defender napping, and beats him to the cone for the score. Seeing the areas of the field that open up after a completion is the key to understanding and utilizing flow in order to get open for a pass. Once you’re able to predict which parts of the field become viable after a throw, all you have to do is time your cut so you’re heading into that space just as your new thrower is looking to pass. Even if you’re late and are running behind your offense’s flow, recognize this and give your thrower an option by seeing how the defense is moving, and heading for the field space that they’re coming from or are ignoring. Sean Myers is an Ultiworld reporter and freelance writer. He played club for Cincinnati Hustle, and recently graduated from law school at the University of Cincinnati. He lives in Rochester, NY, where he plays baseball. You can follow him on Twitter at @discreporter. Comments on "Tuesday Tips: Riding The Motion Of Offense, Presented By Spin Ultimate"